With last night's win over Iowa, the Maryland Terrapins find themselves at 7-2 at the halfway point in the conference season. That's not first place, but they're pretty much right there with Iowa and Indiana. But there is something a bit puzzling about this team, specifically, how can a team consisting of Melo Trimble, Robert Carter, Rasheed Sulaimon, Diamond Stone, and Jake Layman sport just the 7th-best offense in the Big Ten? Suffice to say, that's going to distort things. As a freshman last season, Nickens made 39 percent of his 3s, and he was most accurate in conference play (40 percent). So overall, this seems like a problem that's likely to work itself out. If Nickens can't return to form, that's not insignificant even though he is a role player offensively, and he's basically one-dimensional on that end. There just aren't a lot of players with size that can make 3s, although it's worth noting that Maryland has an embarrassment of riches there. 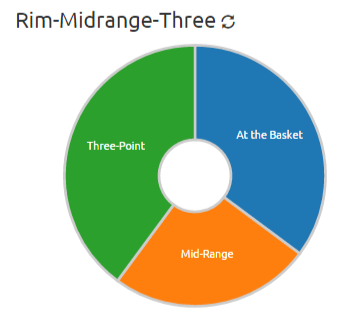 The Terps have been great about minimizing mid-range attempts, and they've been solid on converting around the hoop. So Maryland is shooting the right shots, and they're making (or will start making) the shots they're taking. But unfortunately they're not taking as many shots as they should. Despite the steady hands of Trimble, the Terrapins are turning the ball over on 18 percent of their conference possessions, which is the second-worst mark in the Big Ten (in 2002, that rate would have been the best in the Big Ten. How things have changed). One might explain this as simply the price of admission for a team that puts three players standing 6-9 or taller on the floor for the majority of the time. And sure, Layman's turnovers are slightly higher than the team average. And backup center Damonte Dodd is a mess when you ask him to move in space—with or without the ball. But I think the bigger issue here is Sulaimon. Your backup center usually isn't going to help keep the turnovers down, and Maryland's big men, in general, are doing relatively well in that department. But Sulaimon's turnover rate is high, particularly for a non-point guard (18.8 in conference games). He didn't have these issues at Duke, but that was a different offense as well. I don't know if that's the cause, or if it's something else, but Sulaimon needs to be much more reliable with the ball if Maryland's offense is going to reach its potential. That probably does not have to happen for Maryland to win the Big Ten, but I suspect it will if this team wants to still be playing on the final weekend of the season.